Ilse van Lamoen’s film Daughters of the Niger Delta is screening after the short film Para Kay Ama (For Grandmother) at 6.30pm on Friday 29 November. We caught up with Ilse prior to the European Premiere of her film. What is your background and how did you get involved in MIND (Media, Information & Narrative Development)? When I moved to Nigeria in 2004, I had worked for six years as a political science researcher in various Dutch universities (MA specialisations: international relations and gender studies). I loved analysing social reality, but was keen to do something more change-driven than the mere production of academic knowledge. I was lucky enough to find a job in Nigeria with the international non-profit organization VSO. This job enabled me to travel a lot across the country, visiting VSO’s volunteers who often were based in remote villages. It was a fantastic way of getting to know Nigeria. I learned a lot during those first one and a half years in the country: not just about how friendly, humoristic, and spirited many Nigerians are (contrary to the reputation of Nigeria abroad as a country of violence and criminality) but also about the challenges that people at the grassroots face day in, day out. I developed a desire to strengthen the voices of people at the grassroots, and worked for a while with an organization specialised in participatory drama. Inspired by the mobilising power of participatory drama as a tool for change, I started wondering whether other media – like film, radio, or social media – could be used in similar participatory ways. This is what triggered the foundation of MIND (Media, Information & Narrative Development). MIND gives marginalised groups in Nigeria – including women and girls – access to media tools and skills to strengthen their public voices. We build their skills to frame their own views and stories in catchy media messages (film / radio/ social media) that can be used for advocacy purposes. How was Daughters of the Niger Delta produced? 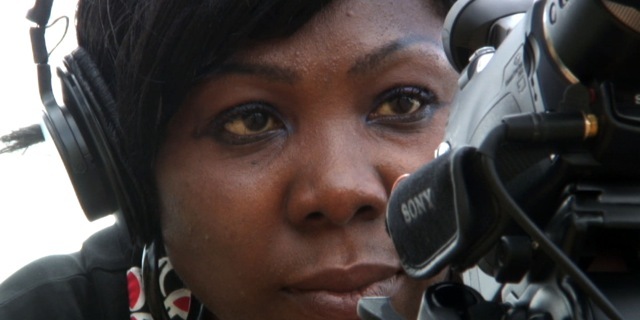 Daughters of the Niger Delta is a bottom-up film production. Rather than bringing in external filmmakers to document the lives of women, young women from the heart of the region were equipped with the tools and skills to do so themselves. 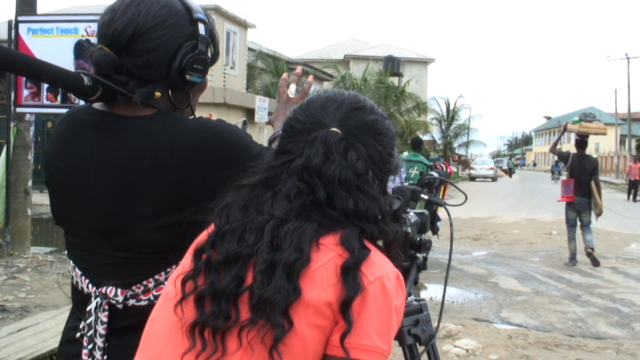 They were trained in filmmaking as part of a MIND capacity building program entitled FEMSCRIPT. The peer filmmakers were in the driving seat of framing the film’s messages and images, coached by professional researchers and filmmakers. They did research on gender and women’s human rights in their own communities. They spent weeks with everyday women to capture their daily lives on film and encourage them to share their life stories. The result is a touching testimony of everyday life, highlighting injustices that we rarely hear about in the news. The trainees were amazingly successful in building up trust amongst their peers. Women who never learned to speak up for themselves gradually opened up in front of the camera. This level of trust would have been impossible to build up even by the most seasoned external film crew. In the edit stage, the peer filmmakers helped picking, framing, and validating the film’s key messages. They deserve just as much credit for the end result as the director, trainers, and editors involved in the project. How did you come up with this original film idea? The short films were intended to be used for local advocacy purposes, but the messages seemed important enough to be shared with a wider audience. Thanks to a grant from the German Embassy we were able to collect additional footage and produce Daughters of the Niger Delta. 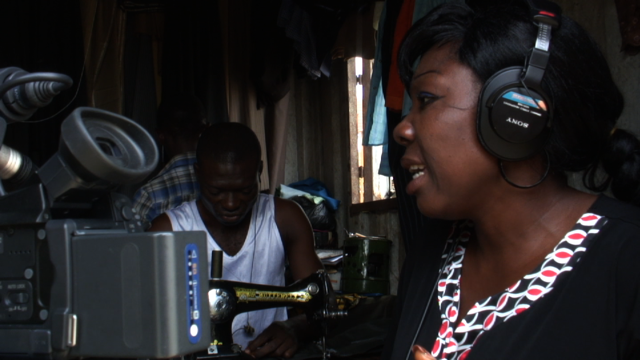 The film is made by nine women from the Niger Delta. How did they get involved or how were they chosen? The selection of the filmmaking trainees was a highly competitive process. We publicly announced the traineeship vacancy and the response was overwhelming. Based on a range of selection tools including motivation letters, qualifications, recommendations, test assignments, and interviews we shortlisted nine candidates. MIND regretfully had to turn down many great candidates, but the trainees who made it through the competitive procedure turned out to be a winning team. What was your main role as the director? When the project commenced I never expected to be directing the film. Initially my role focused mostly on the overall project coordination and facilitation of the project’s gender capacity building and research components. FLL’s filmmakers did a fantastic job building the trainees’ sound and cinematographic skills, while I delivered inputs for the narrative content (helping the interviewers to frame and refine questions). I only picked up a directing role in the final stages of the project. When we started the edit, I joined one of FLL’s filmmakers in selecting text and images and building the overall storyline. Once the first cut was ready, a wonderful framework had been built but some key issues that the trainees had brought up didn’t optimally come out yet. We hadn’t scheduled enough time to process all the footage, but we were running low in budget and couldn’t afford to continue paying professional edit fees. So I ended up editing / directing the film’s final cut in my own time, in regular consultation with the trainees. As an autodidact, I gratefully used what I had learned from working side by side with the editor in the initial edit phase. I’m extremely thankful to my wonderful family and friends for bearing with me in these hectic months that totally disrupted my work/life balance. It was an intense and sometimes painful learning and production process but I don’t regret one minute of it – especially not as I’ve witnessed the pride in the eyes of the filmmaking trainees and interviewees once they watched the final result. I can’t tell you enough how rewarding it is to see the film travelling across the world today. When we were accepted into our first film festival one of our trainees texted: “I am speechless. My joy knows no boundaries”. Our admission to the London Feminist Film Festival is equally exciting. We’re thrilled to know that our film will be watched by fellow women’s empowerment advocates across the ocean – and this will be our European premiere. 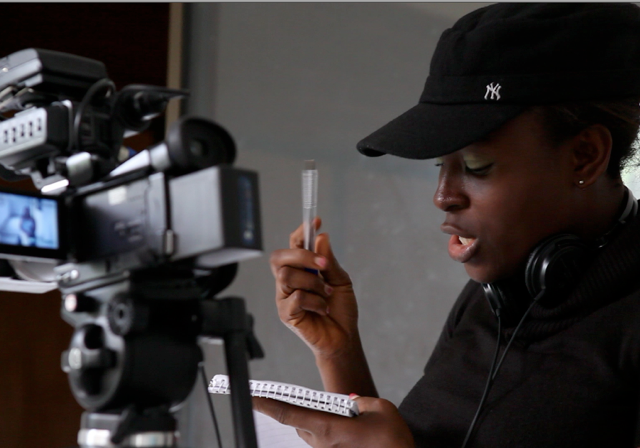 What did you take away from directing Daughters of the Niger Delta? Awwww, tough question! Too much to mention really … If anything stands out, it’s the powerful capacity of participatory research and filmmaking as tools for self-reflection. “Most of us taking part in the training did not realise how bad women’s work load is until we were asked to analyse it”. “It opened my eyes to know that you can have access to resources without control”. “The human rights session was very enlightening. I was shocked to hear that the Nigerian constitution allows men to beat their wives”. “It opened my eyes to know that women actually have a lot of rights which they are not aware of (including me) and therefore are not enjoying”. Awareness was not just raised amongst the trainees, but also amongst the community women they interacted with during their field trips. While initially hardly any of the community women dared to speak out in the camera’s presence, several weeks later when the trainees returned for additional footage some women were almost fighting over the question who should be filmed first. When a trainee asked what had made them change their minds, they said they’d been talking about the issues amongst themselves and now had a lot more to say. One widow who initially seemed to accept her deprived position as a widow gradually started questioning the fairness of the traditional customs in her community. These stipulate that widows cannot remarry, and that the husband’s family has the authority to decide what happens to the household properties. She was keen to mobilise fellow widows in her community to request the traditional council to change these customs. Another woman who didn’t seem to be aware of family planning methods before our crew arrived, managed to persuade her husband to explore options by the end of the project. Having given birth to 11 children, she didn’t want to get pregnant again. Such changes show the power of participatory research and filmmaking. Rather than preaching / lecturing, the mere act of asking questions triggered people to re-think their own lives. It was encouraging to see that sensitisation already took place before the film even was shown to external audiences. Today, Daughters of the Niger Delta can be watched at film festivals across the world. We’ve also been able to find funding for Mobile Cinema activities in the region where change is needed most: in the heart of the Niger Delta. Since March this year, Daughters of the Niger Delta and other films produced by MIND have been displayed in over 200 communities across the Niger Delta as part of two projects: FAST and TND. The aim of these grassroots-based Mobile Cinema initiatives was to spark dialogue on the issues addressed in the films. The large audience numbers and passionate viewer responses we get to these local screenings are highly encouraging. Viewers indicated that Daughters of the Niger Delta shed new light on themselves and their situation, and were keen to look for solutions. In many communities, people have asked the support of our screening team to return for follow-up local advocacy. Cordaid’s FAST funding enables us to do so in several communities – though the demand keeps growing. 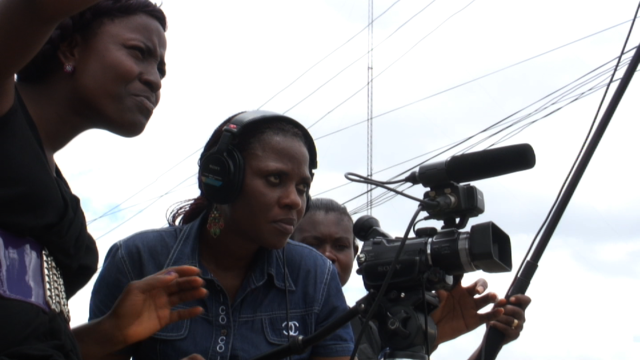 What is the main aim for MIND in making films like Daughters of the Niger Delta? MIND would be excited if Daughters of the Niger Delta can convince public analysts and decision makers that lots can be learned from women’s voices – not just about ‘women’s issues’ but also about mainstream current affairs. Women activists who have fought for decades side-by-side with men for eliminating the oil and gas pollution in the Niger Delta often feel painfully unsupported by their male peers when it comes to overthrowing traditional practices that undermine women’s human rights. “Let us resolve the big issues first, then we’ll come to women’s problems”, is an often-heard response. Rather than setting aside gender as a matter of secondary importance, Daughters of the Niger Delta shows how gender is intrinsically interwoven with mainstream current affairs in the region. Women are hit hardest by the environmental pollution in their backyard. They suffer most directly from the inadequate public service delivery in their communities. And their rights are further undermined by exclusionary gender practices. Moreover, women could be powerful catalysts for change in the region: they are the main engines keeping a somewhat normal economy of provisions going in the vastly impoverished Niger Delta. They provide most of the food for their families. They invest in their children’s health and education. And they do everything they can to enhance their children’s future prospects. Hopefully, our film can convince those holding the power strings in the Niger Delta that investing in women’s empowerment can help to navigate the Niger Delta out of its troubled waters. One of my old-time Dutch favourites is Antonia by Marleen Gorris (1995). 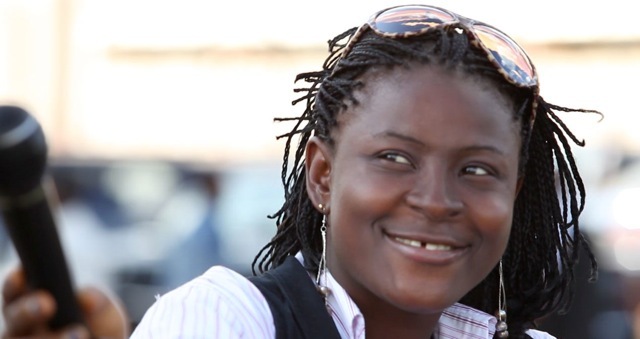 Tickets for Ilse’s film are available here: https://londonfeministfilmfestival.com/lfff-2013-programme/lfff2013/daughters-of-the-niger-delta-short/.